"A Nice Week Here In The Northern Forest!" It was a nice week here weather wise with a little rain and lots of sunshine. There were a couple of hot/humid days. However, after the long Winter we just experienced , the warm weather is appreciated. The Black Flies have returned and are making their presence known. Luckily with the rain and also the benefit of the wind this week, their annoyance was minimal. The dogs are again this week chasing Butterflies as they flutter through the kennel. When not engaged with Butterflies, they are being entertained by a family of Rabbits that have taken up residence by the chalet. The result of the mating season of the frogs here is an abundance of Tadpoles in the lake as witnessed in one of the above photos. The forest is starting to green up with the trees sporting their new leaves. The colors at this time of year are vivid. This week, I would like to introduce Hurit who will part of Cecile's team this coming season. Hurit will turn three in the month of June and is a product of the Tony/Cobalt breeding. She was a late bloomer with just getting a full season running last Fall/Winter. She might have been a late bloomer, but did she ever bloom! She started in the last Team position moving up in the team to first Team, then Point and finished the season with a run at Lead. She has become a very confident dog and is showing great potential to become a supper performer. Hurit is a perfect example the having patience with a young dog will payoff in the long run. Not all dogs mature at the same rate!
" The Black Flies Have Returned In the Northern Forest!" It was a week here with a variety of weather patterns. From hot, humid sunny days to thunder storms ending the week. With the hot humid weather, the black Flies are making their return to the forest and will normally stay until the end of June. The dogs, here at Miortuk, have had fun chasing butterflies and going crazy over a family of rabbits that have taken up residence here. It is very visible the dogs that have more Pointer in their back ground. The dogs are looking good with nice shinny coats,maintaining a good weight and a very happy attitude. They are enjoying their Summer break! It is great to interact with dogs spending time in the kennel with the morning soup, water with turkey meat, the evening meal and then quality petting time with each dog at the end of the day. Without the dogs, it would be a very lonely existence here even with all the beauty that is around me. 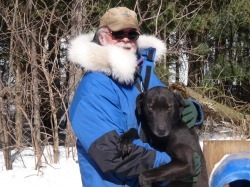 This week, I would like to introduce Yakuk And Tepeu who will be a integral part of Cecile's 6 dog team next winter. These two turned 17 months old this week and have already showed great potential. They are the product of the Angel/Willy breeding and resemble their father in looks & build. They are very fast, smooth, enthusiastic runners. Tepeu has already had the opportunity to run lead and showed good potential for running in that position. However, these two are incredible running together. They both have very pleasing personalities and enjoy interaction with each other and anyone that will take the time to pet them. "A Glimpse Of The Week Here In The Northern Forest!" The first few photos show life here last week with some beautiful Spring weather and the view of the lake from our chalet. The other photos speak for themselves showing the idyllic life at the ranch. Here at Miortuk, Lena was placed in the whelping pen just in case she will have puppies. The week here finished with two days of steady rain, at time very heavy that caused flooding and road collapses from the water erosion. The highway through the mountains coming up to Saint Michel des Saints had some water damage and around the village some flooding that washed out roads. We were lucky here with no damage, although you can see a distinctive rise in the water level. This week, I would like to introduce Kira. She is second newest addition to the Miortuk Team. Kira is a yearling that ran all last season getting experience. She is a very adorable, shy little female. I have been spending a great deal of time with her in the kennel to work on her shyness and I can see some progress every day. However, when hooked up in the team she is totally different being in her element. She is leaping straight up in the air lunging to get going. When on the trail she is very focused and hard driving. She never seems to get fatigued. Kira will probably run at Point or the first Team position. We have had her up front at Lead this past season and she showed potential there. "How Quickly Things Can Change In The Northern Forest!" The first two photos were taken on the same day, one in the morning and the other in the evening. The next two photos of the lake were taken a couple of days later. It was amazing, how fast the ice disappeared! As of today, there is only a few patches of ice left in the kennel. These areas were covered with straw which protected the ice from the sun and rain. This week more flocks of Canada Geese were migrating north and the Loon have returned to the lake. The sounds of Spring resonate through the night with mating songs of the frogs and the love cries of the Loon. It is only four and a half months before we start Fall Training. So, starting this week, we decided to introduce the dogs for next seasons teams. ROXIE is the first dog to be introduced and ironically the newest dog in the kennel. Roxie is an experienced race leader, running in both the Open & 8 Dog Classes. Last season, we realized that we needed an experience race leader to help support a great group of our young leaders. Roxie quickly made herself at home here with an incredibly friendly personality. You can not walk by her without stopping to pet her. In the team, her personality changes to being very serious and all business. With Roxie at lead, we expect she will lead our Open Team to the next level in competition.
" The Spring Melt Is On In The Northern Forest!" The above photos shows the progression of the Spring melt experienced here this week. Almost all the snow is now gone and as the photos show the ice is rapidly going in the lake. It has rained most days this week causing the speed up of the melt. Half the kennel has no more snow/ice. While the other half the snow/ice is slowly going. By the end of next week the kennel should be clear of the Winter remains. Then the big clean up of remaining straw that was buried in the snow from the Winter continues. The dogs are enjoying digging in the sand and making home alterations. By alterations, I mean chewing on their houses. Lena is due to have puppies on the 19th of May. So the countdown begins. Yesterday evening, I heard the first flock of Canada Geese returning on their Spring migration. This morning I heard the frogs starting their mating songs and the Loon calling for its mate. Yes, the forest is starting to spring to life with renewal.